Let the festivities begin…Day at the Docks kicks off tomorrow! We are happy to announce that this year’s Day at the Docks festivities will run for 4 days, starting tomorrow, September 13th. Join us to celebrate the spirit of Hatteras and to honor the heritage and living traditions of local watermen! On Friday morning, September 14th at 11am, join the National Weather Service from Newport, NC, Dare County, and the Island Free Press for a Hurricane Awareness Town Hall Meeting at the Graveyard of the Atlantic Museum. Wind down and gear up for a plethora of Saturday activities by heading down Hwy 12 to Lee Robinson’s General Store for “Taste of NC.” Starting at 4pm, this event will feature tastings of North Carolina wine, beer, and seafood, along with talks from local authors and live music by Banjo Island. Saturday is a BIG Day at the Docks! 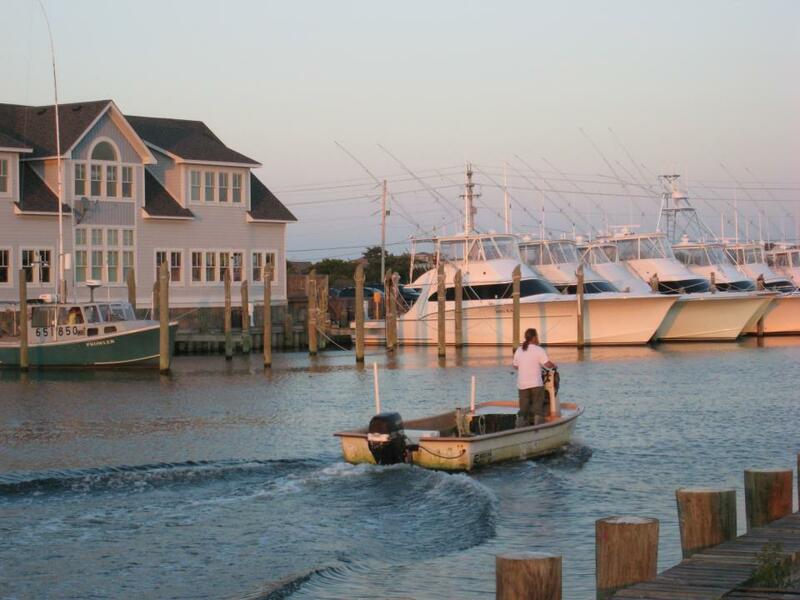 The docks of Hatteras village will be teeming with activities and events starting at 10am. Activities for the day include a concrete marlin competition, a survival suit race, and a net hanging competition showcasing this time-honored skill. There will also be several activities and events geared specifically towards children, such as designing a fish print t-shirt, crab races, and a fishing contest. There will also be musicians, poets, and authors performing throughout the day around the docks, as well as free skin cancer screening sponsored by the Hatteras Island Cancer Foundation. Be sure to stop by The Gazebo at Village Marina from 10am-3pm to catch a few local seafood demonstrations and then head on over to the Chowder Cook-off sponsored by the HICF. At 3pm, claim a spot at the Willis Boat Landing main stage to watch two of Hatteras Island’s most popular restaurants and their chefs go head-to-head in an hour long competition to prepare dishes using a local seafood ingredient that will be revealed just as the competition gets underway! There will be an awards ceremony at 4:30pm, followed by the boat parade at 6pm and the solemn Blessing of the Fleet. Be sure to join in the fun at the Hatteras Village Community Building at 8pm by dancing the night away on the “lawn” in true Hatteras fashion. On Sunday, September 16th, head over to The Seaside Inn at 1pm for shrimp ‘n’ grits and then head out on the water to culminate a great weekend of celebrating our watermen and their generous contributions to our fragile, island community. The National Park Service has announced that there will be a new permitting process for Off-Road Vehicle (ORV) usage in the Cape Hatteras seashore. This rule is effective February 15, 2012. Permits can be obtained beginning on February 15 at any of the three NPS ORV permit offices located at Coquina Beach, the Cape Hatteras Lighthouse Visitor Center (Buxton), and the Ocracoke Visitor Center. These offices will be open year-round, seven days a week, except Christmas Day, from 8:00 a.m. to 4:30 p.m., with expanded hours on weekends and holidays during the summer season. In order to provide the public with ample time to obtain a permit, there will be a transition period between February 15 and March 15 before the rule is fully implemented and enforced. The FAQ and map is available on the Seashore’s website. •	Driving will only be permitted in specified areas, and those areas are subject to closures due to “resource protection” or if the capacity limit for the area has been met. Available ORV Routes are listed on the map here: http://www.nps.gov/caha/planyourvisit/upload/2012-CAHA-ORV-Routes-Map-2.pdf . •	Have no more than two axles and be equipped with tires that are listed or approved by the U.S. Department of Transportation as described at: http://www.safercar.gov/Vehicle+Shoppers/Tires/Tires+Rating/Passenger+Vehicles. The following ramps are designated for off-road use to provide access to ocean beaches: 2.5, 4, 23, 25.5, 27, 30, 32.5, 34, 38, 43, 44, 47.5, 49, 55, 59, 59.5, 63, 67, 68, 70, and 72. Designated ORV routes and ramps are subject to resource, safety, seasonal, and other closures. Soundside ORV access ramps are described below. For a village beach to be open to ORV use during the winter season, it must be at least 20 meters (66 feet) wide from the toe of the dune seaward to mean high tide line. Maps showing designated routes and ramps will be available in the Office of the Superintendent and on the Seashore Web site. YEAR ROUND:	Ramp 2.5 (0.5 miles south of the southern boundary of Coquina Beach) to 0.2 miles south of ramp 4. SEASONAL (September 15 to March 14):	0.2 miles south of ramp 4 to the eastern confluence of the Atlantic Ocean and Oregon Inlet. 1.5 miles south of ramp 23 to ramp 27. Ramp 30 to ramp 32.5. The following soundside ORV access routes from NC Highway 12 to Pamlico Sound between the villages of Salvo and Avon: soundside ramps 46, 48, 52, 53, 54 and the soundside ORV access at Little Kinnakeet. Ramp 38 to 1.5 miles south of ramp 38. The following soundside ORV access routes from NC Highway 12 to Pamlico Sound between the villages of Avon and Buxton: soundside ramps 57, 58, 59, and 60. Interdunal route from intersection with Lighthouse Road (i.e., ramp 44) to ramp 49, with one spur route from the interdunal route to the ORV route below. Ramp 47.5 to east Frisco boundary. A soundside ORV access route from Museum Drive to Pamlico Sound near Coast Guard Station Hatteras Inlet. Pole Road from Museum Drive to Spur Road to Pamlico Sound, with one spur route, commonly known as Cable Crossing, to Pamlico Sound and four spur routes to the ORV route below. Ramp 55 southwest along the ocean beach for 1.6 miles, ending at the intersection with the route commonly known as Bone Road. 0.1 mile south of Rodanthe Pier to ramp 23. Ramp 34 to ramp 38 (Avon). East Frisco boundary to west Frisco boundary (Frisco village beach). East Hatteras boundary to ramp 55 (Hatteras village beach). Ramp 59 to ramp 63. After ramp 59.5 is constructed, it will replace ramp 59 for ORV access and the route will be from ramp 59.5 to ramp 63. Three routes from NC Highway 12 to Pamlico Sound located north of the Pony Pens, commonly known as Prong Road, Barrow Pit Road, and Scrag Cedar Road. 1.0 mile northeast of ramp 67 to 0.5 mile northeast of ramp 68. A route from NC Highway 12 to Pamlico Sound located near Ocracoke Campground, commonly known as Dump Station Road. 0.4 miles northeast of ramp 70 to Ocracoke inlet. A route from ramp 72 to a pedestrian trail to Pamlico Sound, commonly known as Shirley’s Lane. SEASONAL (September 15 to March 14):	A seasonal route 0.6 mile south of ramp 72 from the beach route to a pedestrian trail to Pamlico Sound. A seasonal route at the north end of South Point spit from the beach route to Pamlico Sound. November 1 to March 31	0.5 mile northeast of ramp 68 to ramp 68 (Ocracoke Campground area). 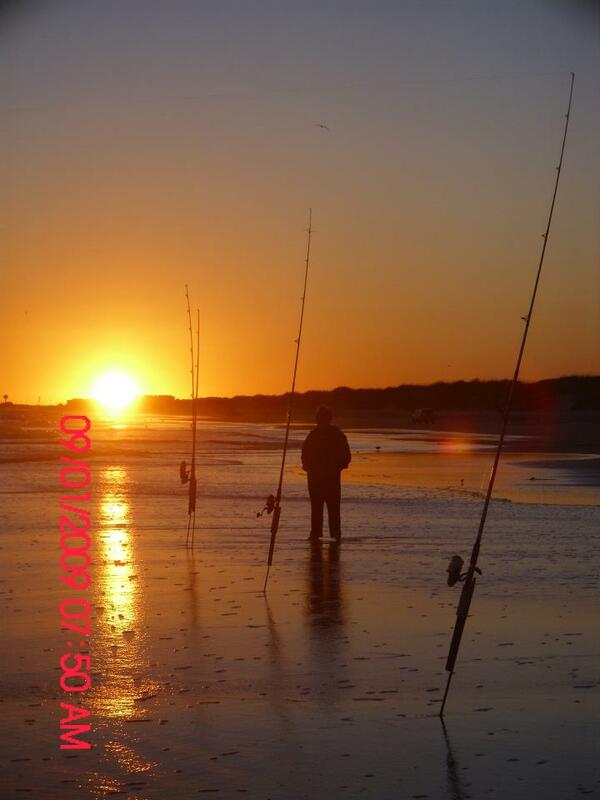 There’s nothing like heading out to the shore with a rod and reel in hand and casting out right from the beach. With intersecting currents and miles of beaches, Hatteras Island on the Outer Banks offers a world of exceptional surf fishing, and novice and experienced anglers alike can find amazing record setting catches just by casting from Cape Hatteras’ 70 miles of national seashore. Picture submitted on Facebook by Sharon Collins. 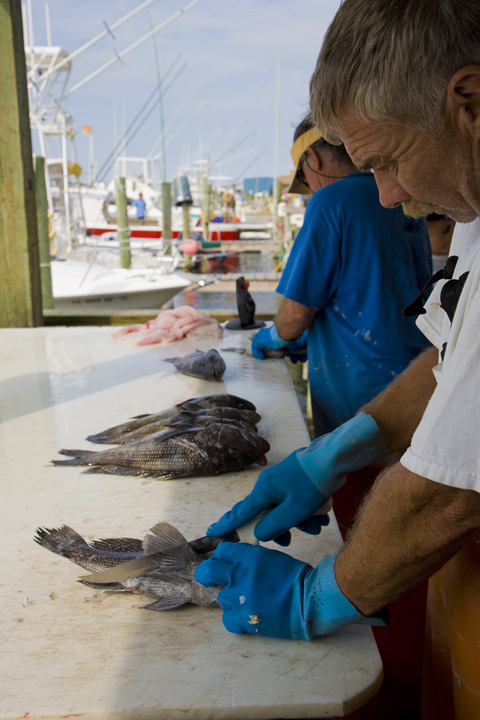 There are so many unique sights and sounds to enjoy while on a Hatteras Island vacation – from relaxing on the beach, to exploring the Pamlico Sound and watching boats of all sizes bring in the daily catch at our area fishing marinas. 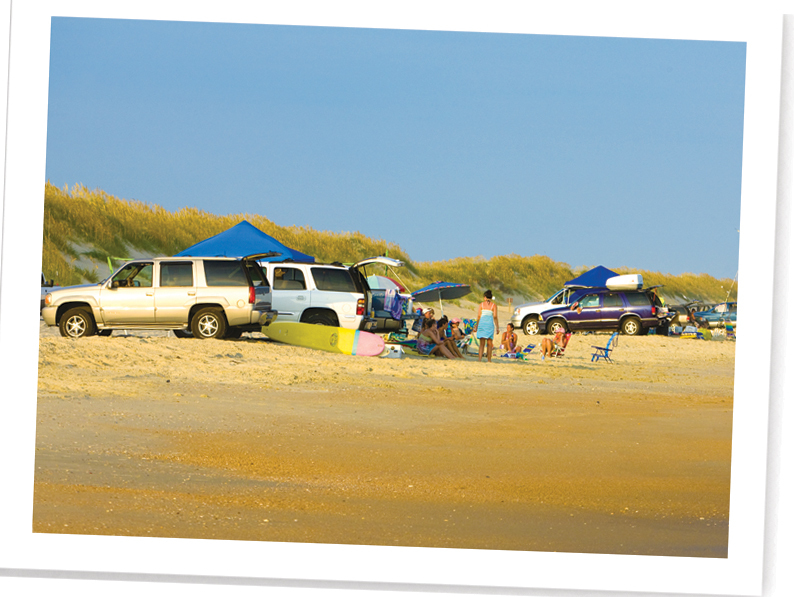 Hatteras Island is known for its beautiful beaches that offer an abundance of serenity and relaxation. Hatteras Island is also known for something else – FISHING. During the off season there is nothing better than grabbing a rod, reel, and cooler full of snacks and heading to the shoreline. News station WXII in Greensboro-Winston-Salem hit the Outer Banks earlier this month and experienced what the ocean has to offer. Click here to watch the FUN video they created. If you want to keep up with current fishing conditions and find out what is biting, Frisco Rod & Gun’s Fishing Report is a great source to keep you informed! Click here to read the latest report. Happy Fishing! We’ll see you on the water! 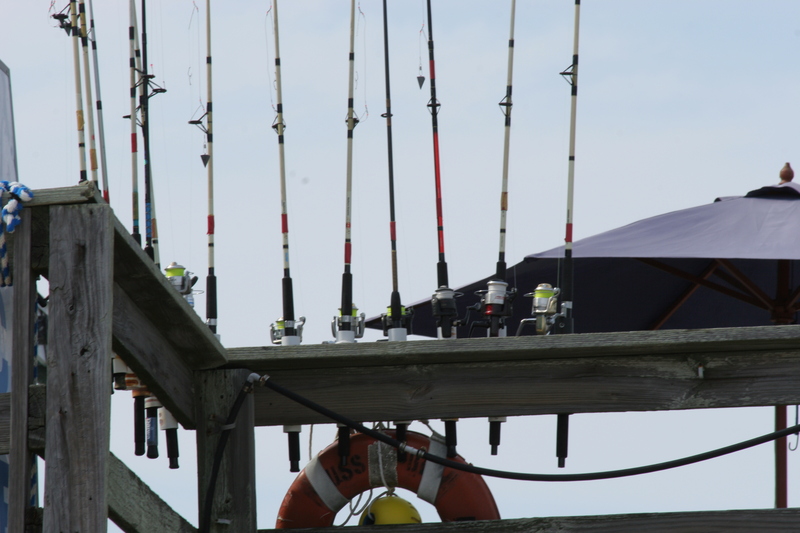 The third annual Red Drum Fishing tournament is currently being held on Hatteras Island till tomorrow (October 22nd at 4pm). The event is organized by the North Carolina Beach Buggy Association (NCBBA) and is headquartered at Frank and Fran’s tackle shop located in Avon. All proceeds from the tournament will be donated to the Methodist Men’s Hatteras Relief Fund (Buxton, NC) in support of the Hurricane Irene recovery. 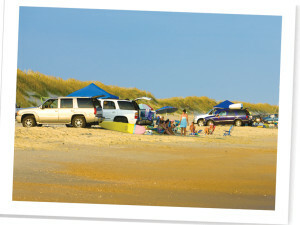 In addition NCBBA is sponsoring “Toys for Tots” at registration for children of Hatteras Island. There are 250 fishermen participating in the tournament which started at 12:01am on Thursday (October 20th). There are participants from 15 states ranging from Texas to Massachusetts. On the first day 10 drum were caught and 9 out of those 10 were citation size fish. Matt Burleigh caught the largest drum so far at 50″. 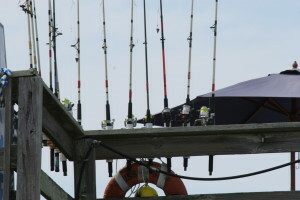 A total of 22 drum were caught up to today ranging anywhere from 19″ to 50″. Two anglers caught three drums each so far. No female or junior catches have been reported yet. Danny Fletcher is leading the blue fish division with his catch being 16.25″ long. 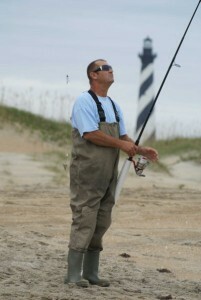 George Mood is leading the sea mullet division with a 1lb 6oz catch. 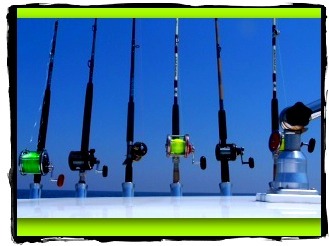 Updates are being made every 6 hours and you can call Frank and Fran’s tackle shop for details at 252-995-4171.